Making money. It’s at the route of what your business does. Whether pure profit is your end goal, or whether you need to release more cash to speed up the overall growth of the company, having a focus on improving your profitability is a vital part of good business management. So, how do you make more money? Quite simply, there are only five ways you can affect the size of your profits. The starting point of any customer transaction is the lead – the point at which you find new targets, or they find you. This is the crucial starting point in the sales journey. These leads are all potential end customers (and customers are where your money comes from, naturally). So the goal here is to improve the number of leads, boost the quality of that lead pipeline of cold, warm and hot targets, and then convert those promising leads into paying customers. Get a real focus on business development and lead generation. Put metrics in place in your reporting to measure your lead generation. Grow your sales team and make sure they’re proactively searching for leads. Improve your website and search engine optimisation (SEO) to bring in more traffic and more enquiries. Raise your brand profile with targeted marketing and PR. At this point in the sales journey you’re at a critical junction. You’ve built up a pipeline of leads, but you’re now at a fork in the road: go one way, and the lead can be converted into a customer; go the other way, and you lead can go cold and disappear into the distance (possibly to a competitor with a more proactive sales approach). So the key to making more money is to covert as many of those leads as possible into paying customers. Make sure there’s a systemised process for dealing with sales enquiries. Put metrics in place to measure lead numbers and conversion rates. Train your sales team in conversion techniques and help them to understand customer needs and how your products/services fulfil those needs. Pull off regular reports that show you where you’re converting well – and focus on the leads that are easiest to turn around. So, you’ve converted your warm leads and promising enquiries into customers and the revenues are starting to roll in. But how do you maximise the potential income from those revenue streams? 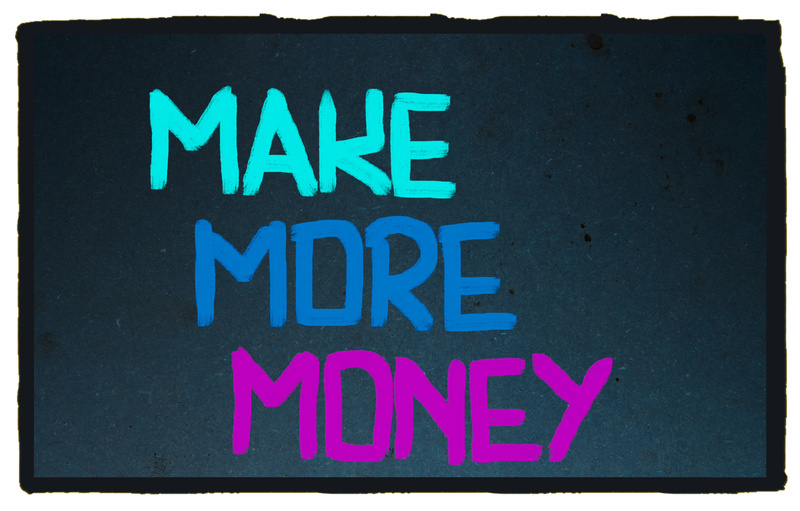 One option is fairly simple (in theory): make more sales. Sell more to these existing customers – build on these customer relationships and find ways to upsell more products and/or services to your happy customers. Expand your product/service range – diversify your existing ranges to include complimentary products/services that increase your offering to customers. Diversify into new markets – are there other sectors you could expand into that would work alongside your current offerings? Discount your prices – although you’ll make less profit on each item, you’re likely to increase the overall number of sales, boosting the overall income. The flipside of discounting your price is to put your prices up. By increasing the fee, you can make more money with the same number of sales. It sounds very simple (and it is) but it’s a technique that should be used with caution. Increase prices for products/services you know sell well – and where your customer base is stable and ‘bought in’ to the product. But me mindful that some customers may baulk at the higher price – set the higher price realistically, so you don’t alienate your customer base. Increase prices in gradual steps over a longer period of time to lessen the impact on your customer’s pocket from month to month. Keep track of your pricing and sales metrics and make sure you’re not damaging sales numbers with your simple hike in price. The cost of making your products or delivering your services will always eat into your profits. And when you factor in everyday running overheads, like building rental or utility bills, it’s easy to see how costs can have a big impact on your overall profitability. So the key to creating a bigger chunk of profit is down to lowering those costs and overheads to maximise the percentage of your revenues that becomes pure profit. Cut down on your everyday overheads to improve your net margin – cut back on utility bills, remove any unnecessary monthly costs and run a tighter spending ship. Put metrics and targets in place to measure production costs and overall spending – and review your spending regularly. You’ve probably noticed that we’ve talked a lot about the need to put metrics and targets in place around your profitability. And there’s a reason for that. Having great monthly reporting around your lead generation, conversion rates, average sales, pricing and costs is what puts you in control of your profits. And Spotlight Reporting is the ideal way to create bespoke reporting on all of these elements of your business. As part of our Xero Trifecta approach, based around Xero online accounting, Spotlight takes all your important business and financial data and turns it into clear, graphical ways to view your performance, targets and key business metrics. If you’re looking to improve your profitability, we can help you put Xero and Spotlight into action. And we’ll provide all the hands-on guidance and commercial advice you need to start seeing those profits soar. Get in touch to book your business in for a Xero Trifecta session.